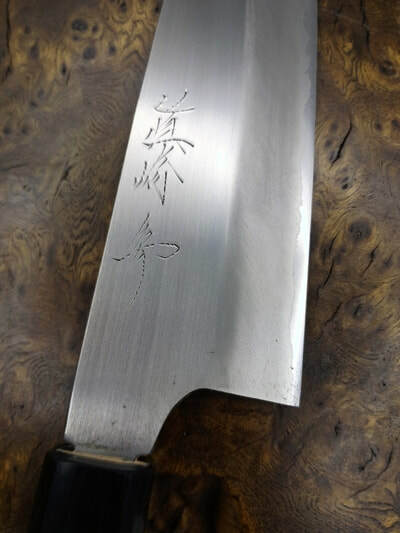 A quiet pleasant "renegade" young maker trained by Yoshikane and currently undergoing further training with Kiyoshi Kato~san of Sanjo after touring whole of Japan on his restored late 70s Harley. 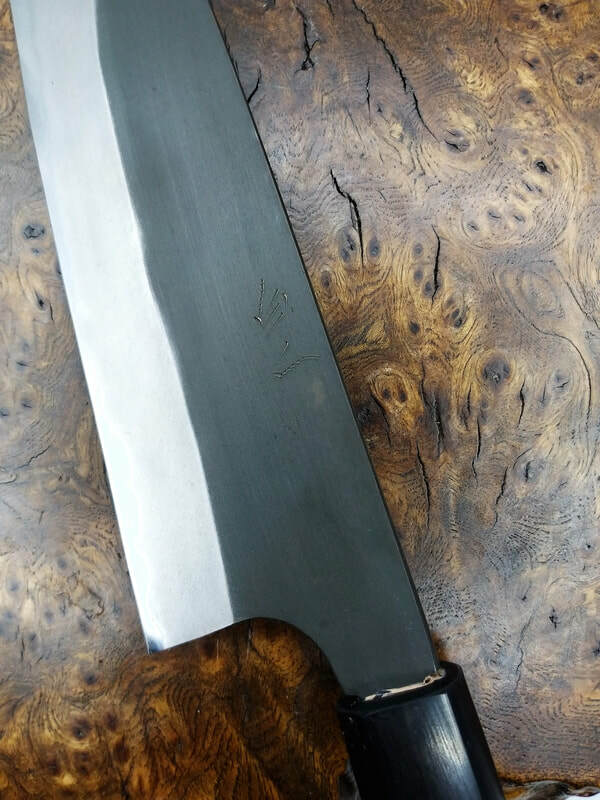 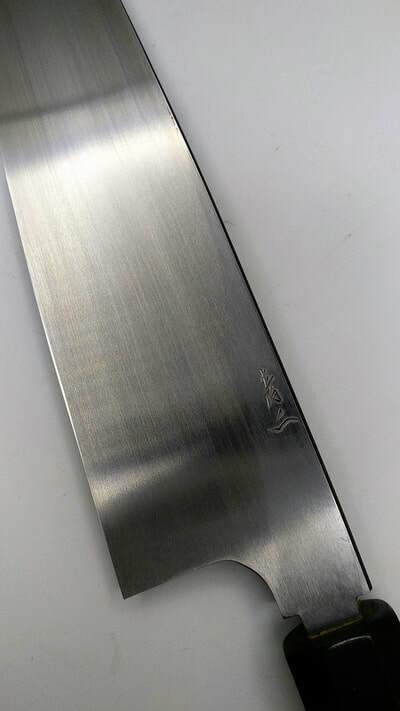 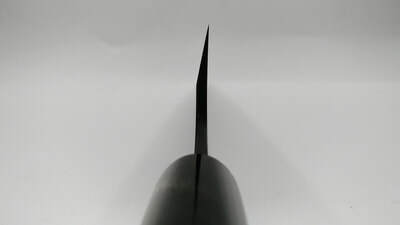 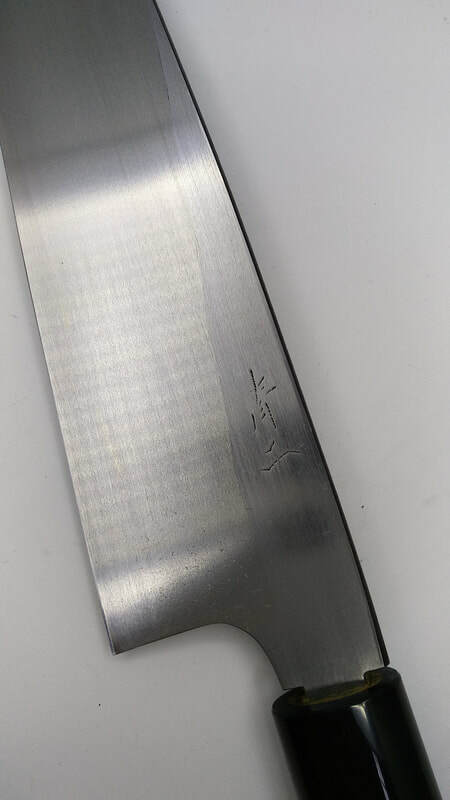 He forges White 2 steel to near the limit of 64/65 HRC, used to be only seen on Honyaki knives only for great edge retention and his distal taper is aggressive starting from 5.4mm to very thin at the tip giving a laserish performance at the front end of knife and workhorse performance at the back of knife. At the moment he forges, shapes/grind, sharpen and does the kanji engraving himself and we like that as all is within his control. 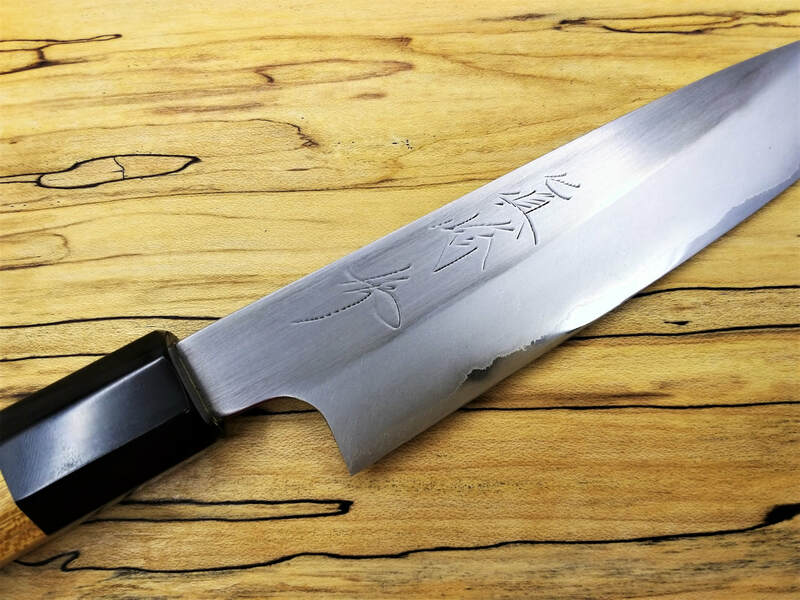 From our renegade knife maker in Sanjo, Naoki Mazaki~san, a response to an overwhelming request, a Custom Stainless Clad in White II (taken 6 months to fruition) exclusive to Razorsharp; taken to its maximum potential of 64+-1 HRC. 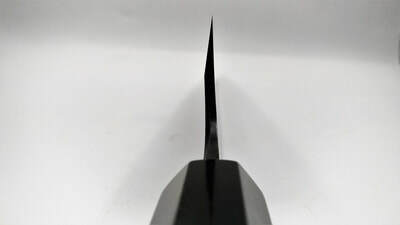 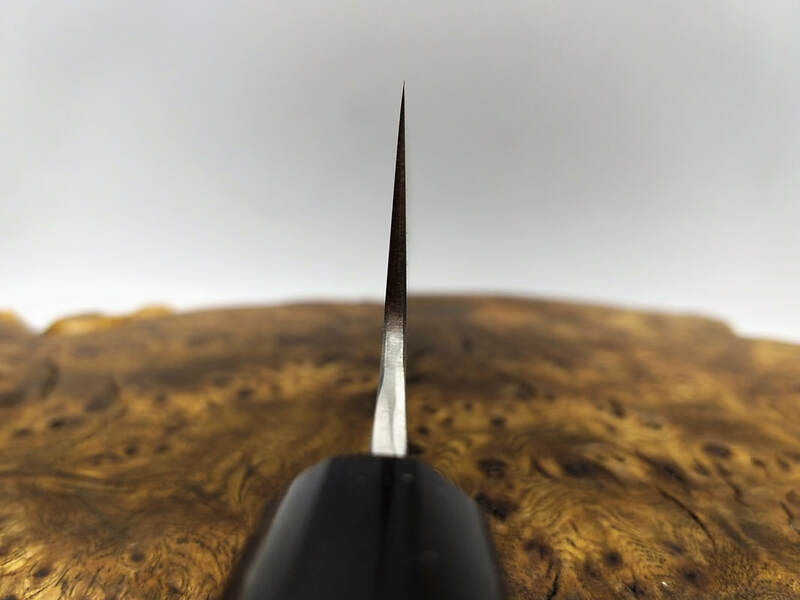 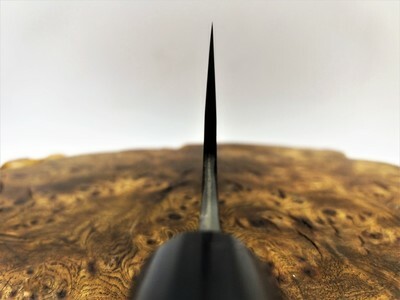 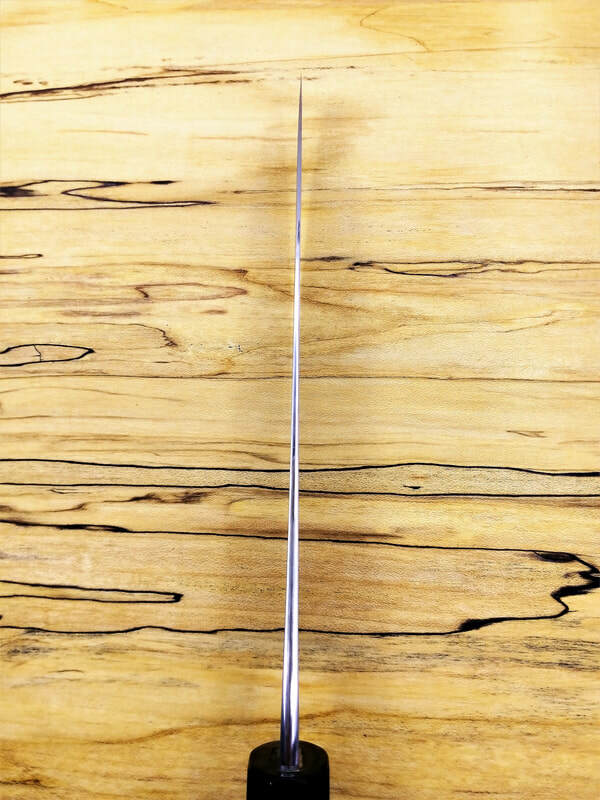 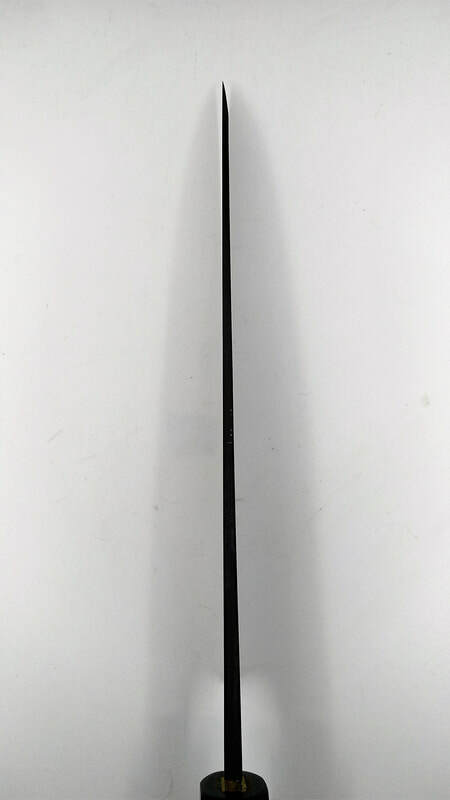 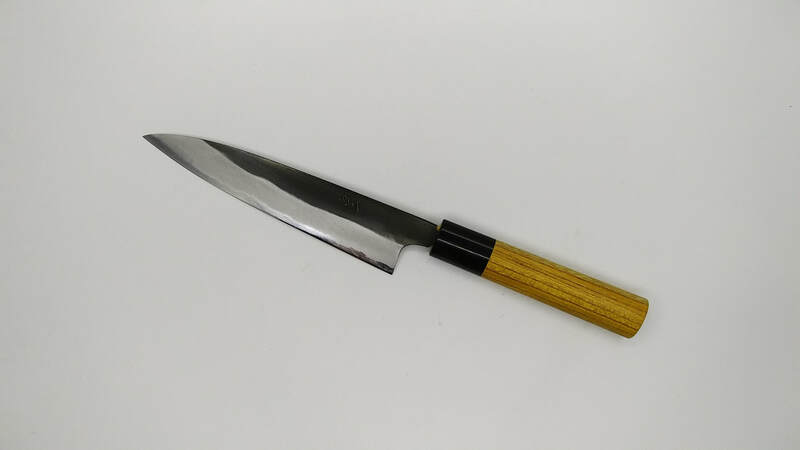 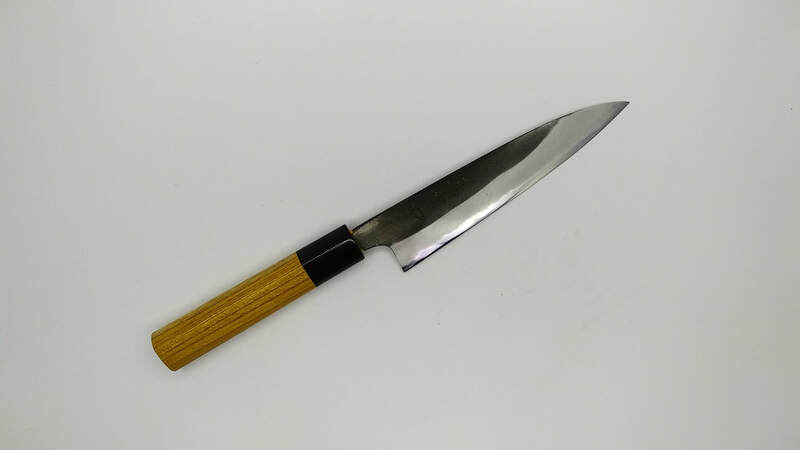 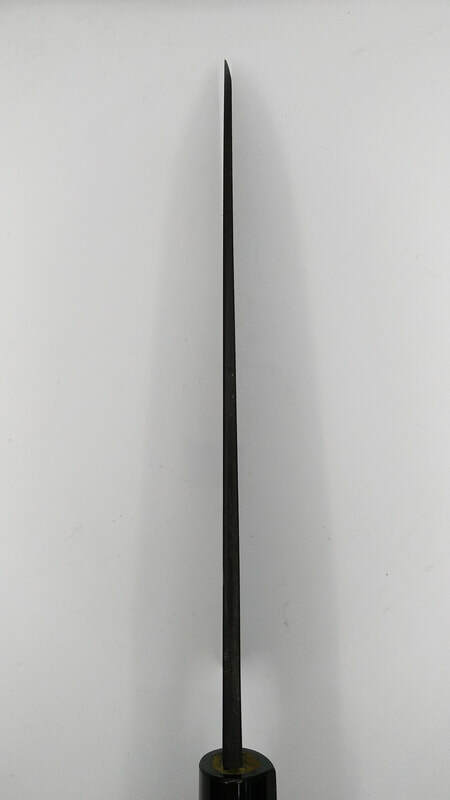 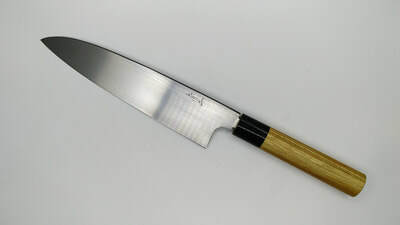 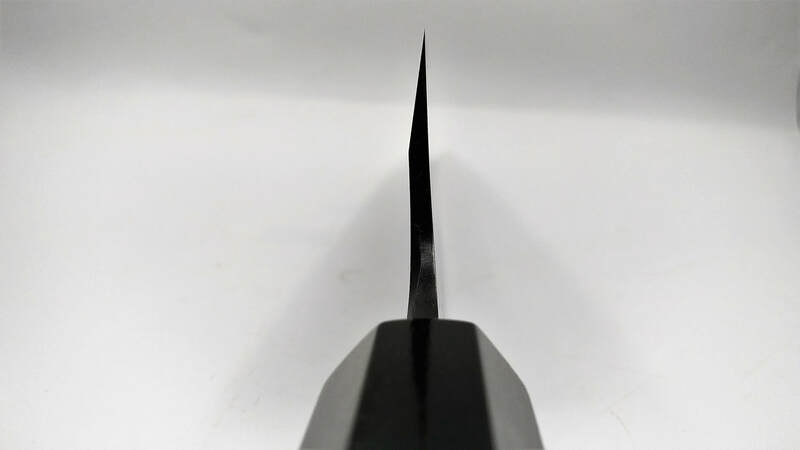 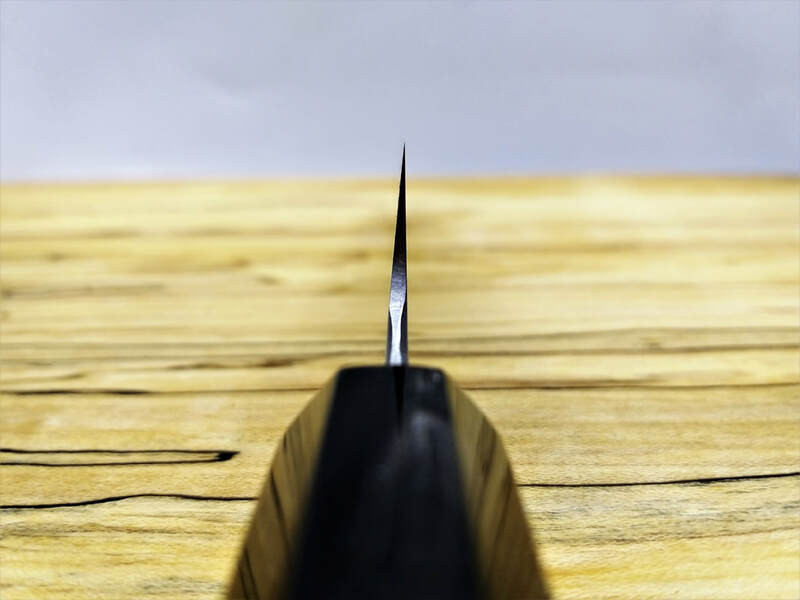 (normally seen on honyaki knives), with the standard aggressive distal taper for a thin very functional tip. 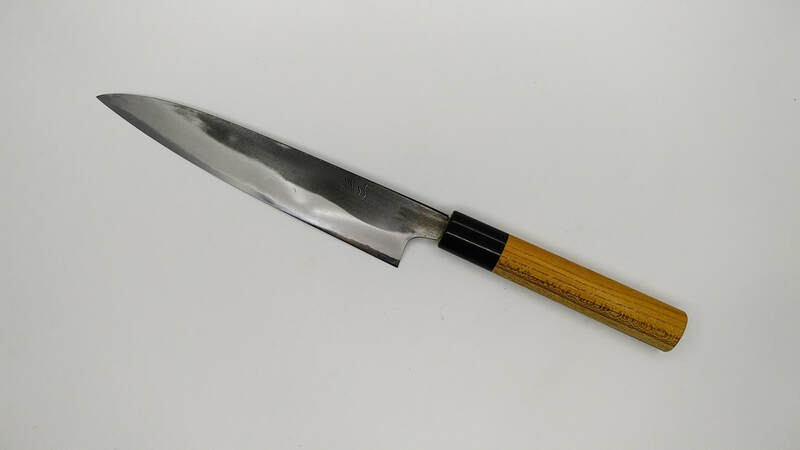 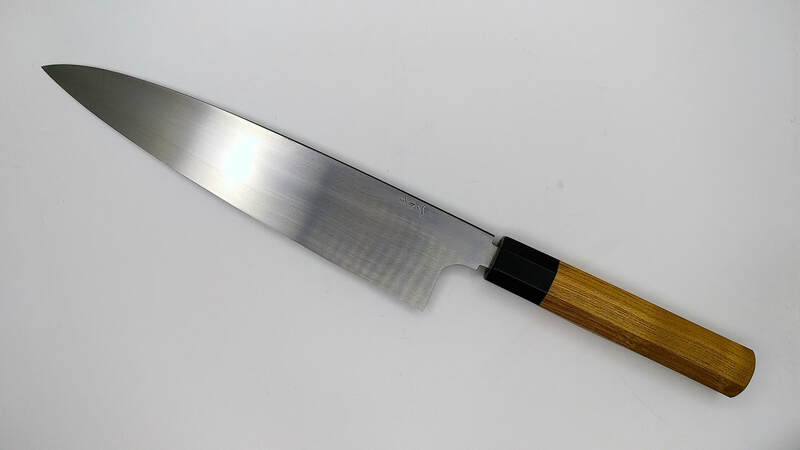 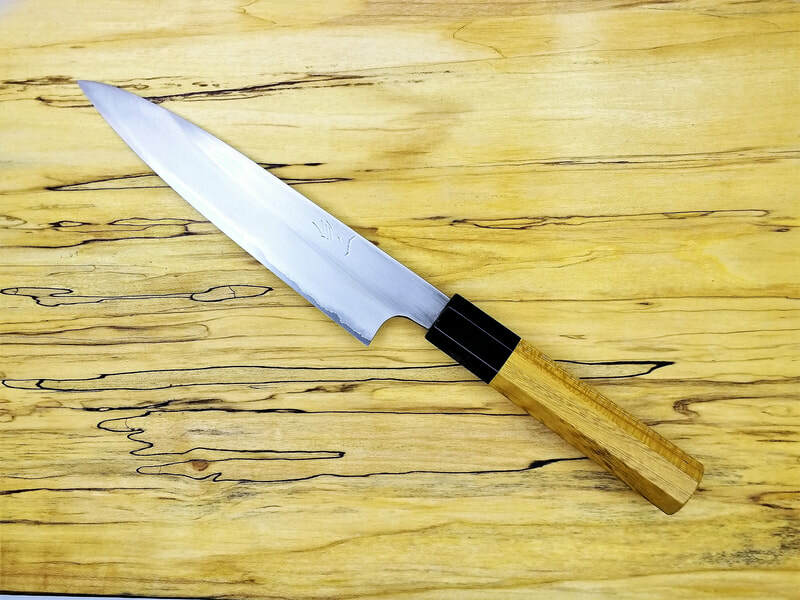 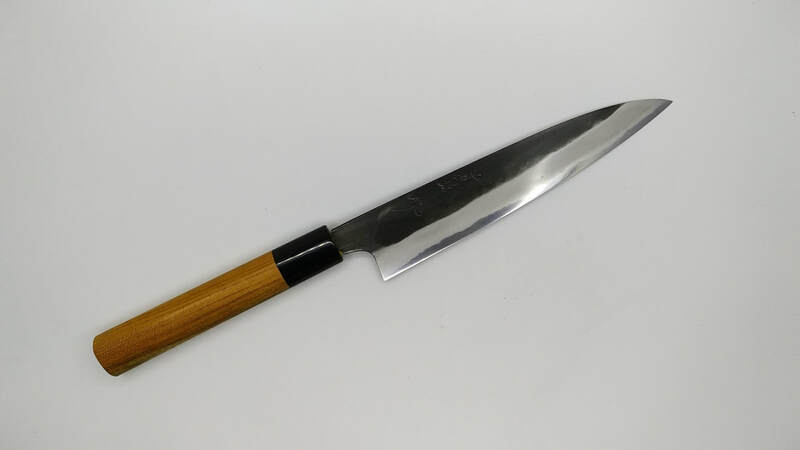 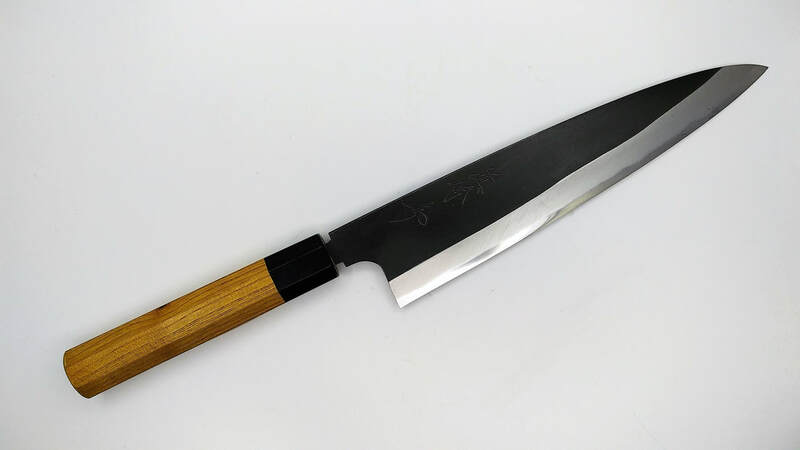 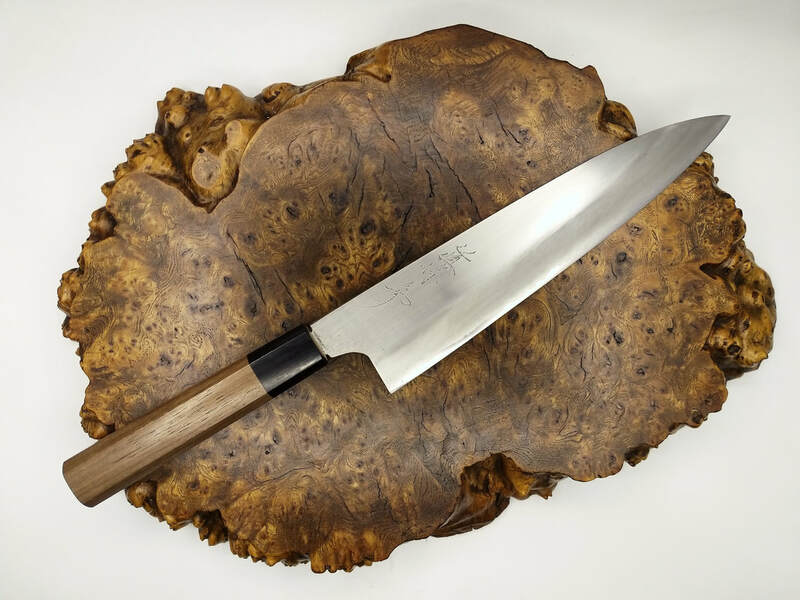 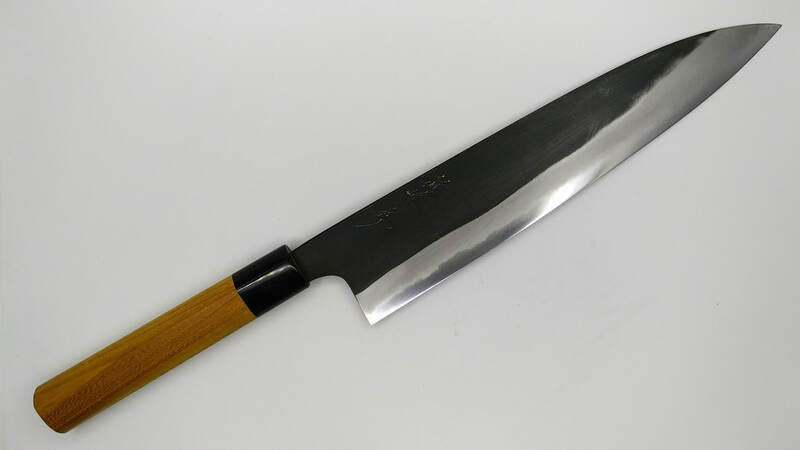 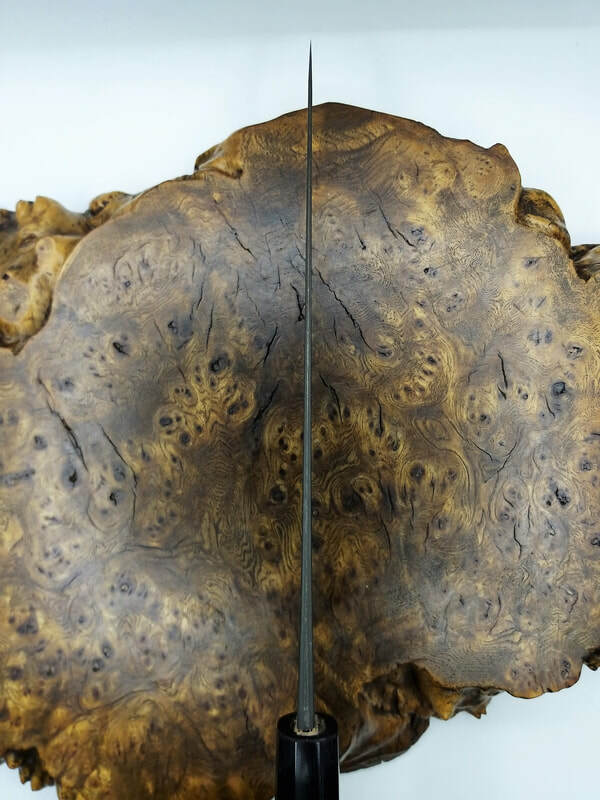 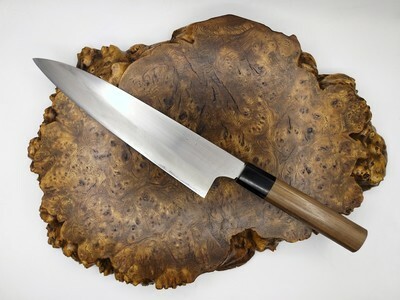 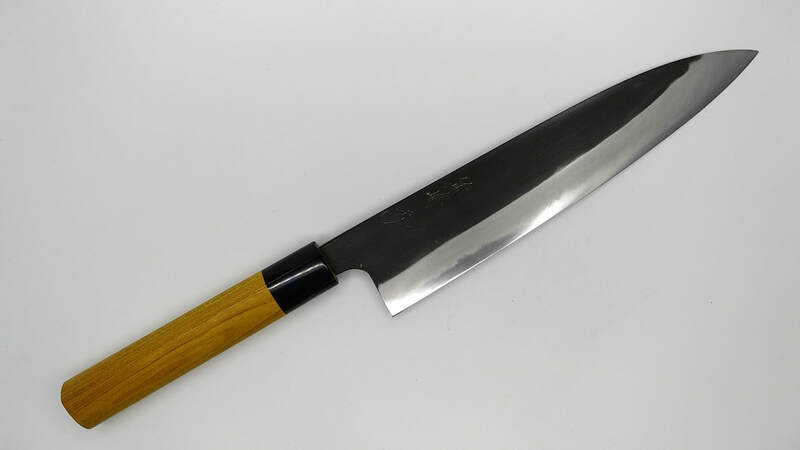 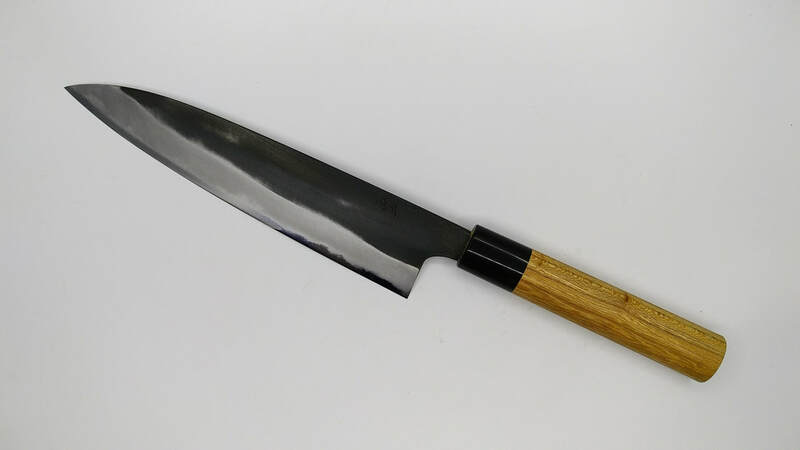 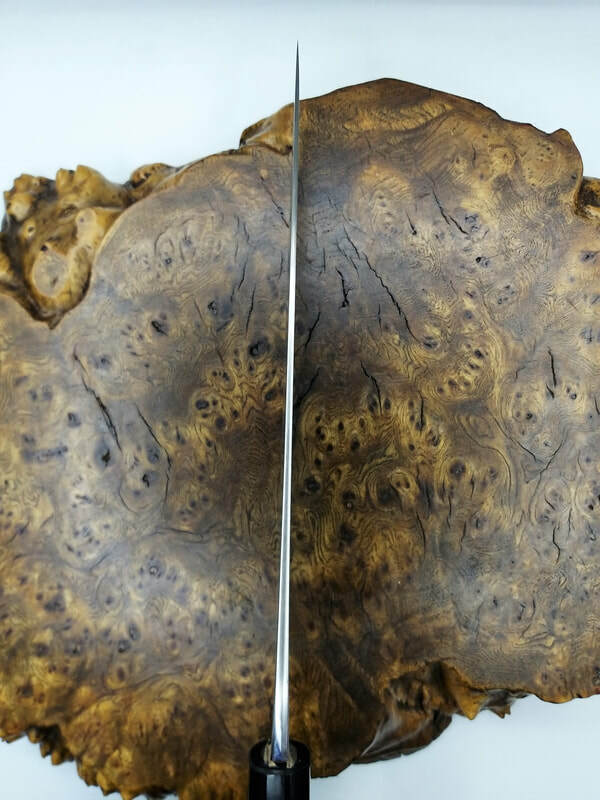 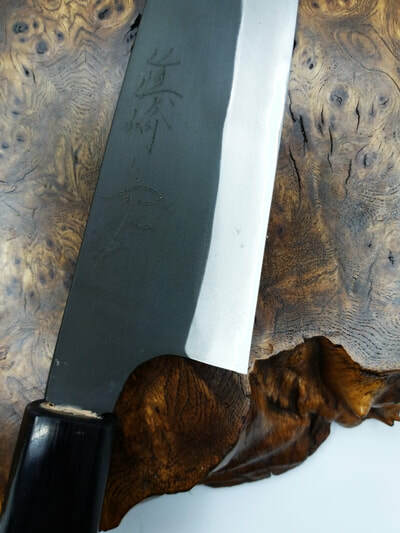 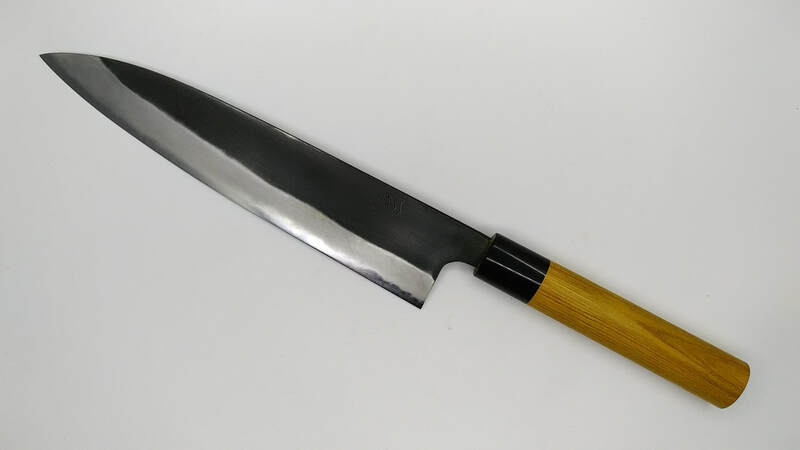 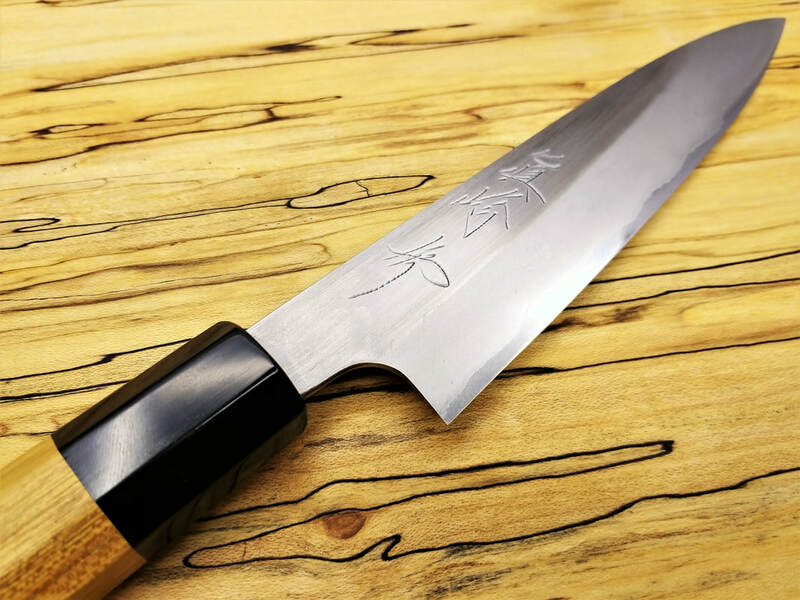 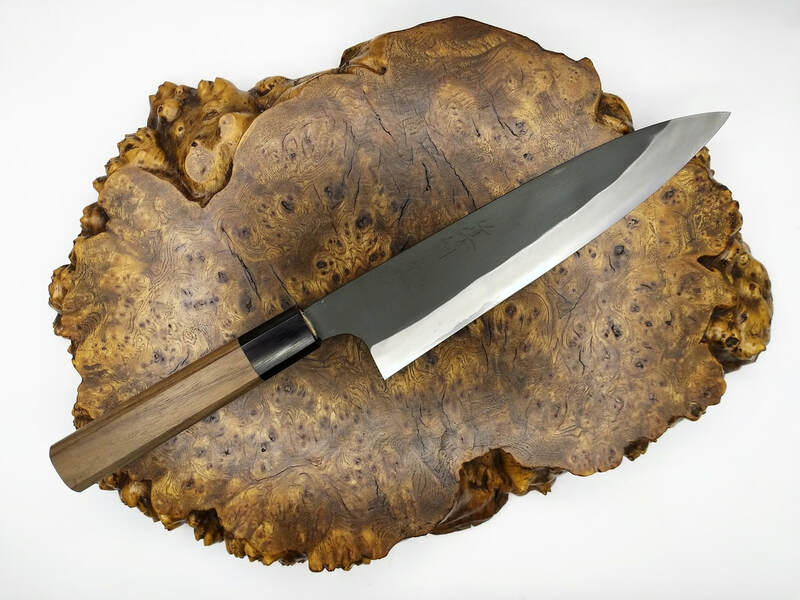 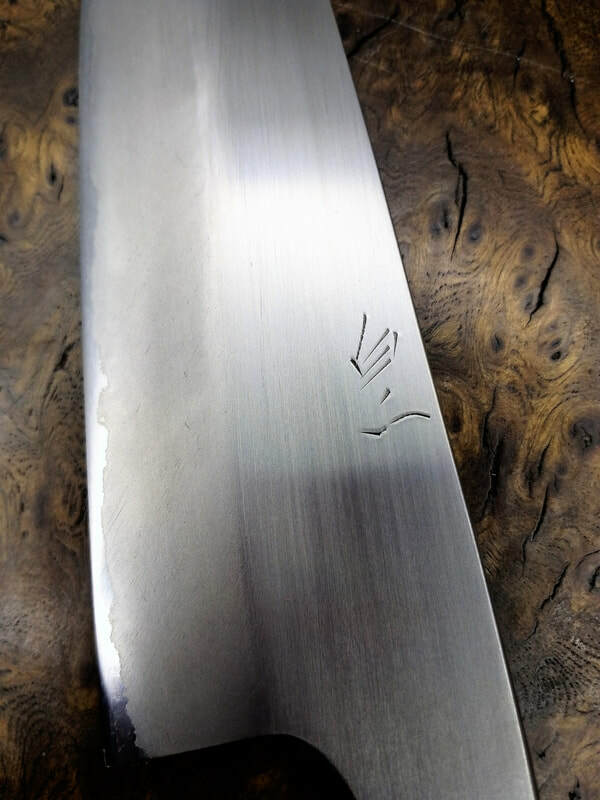 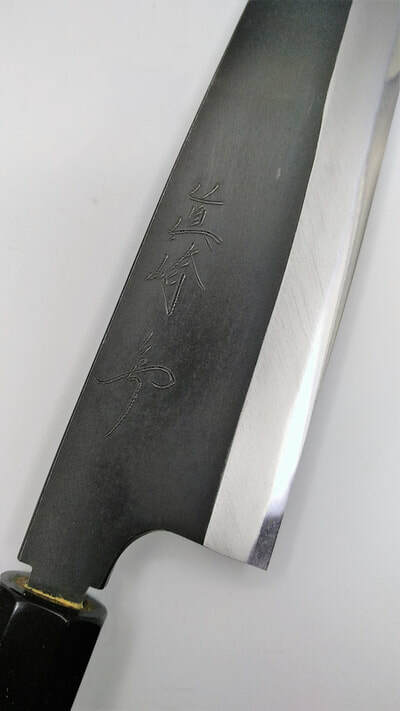 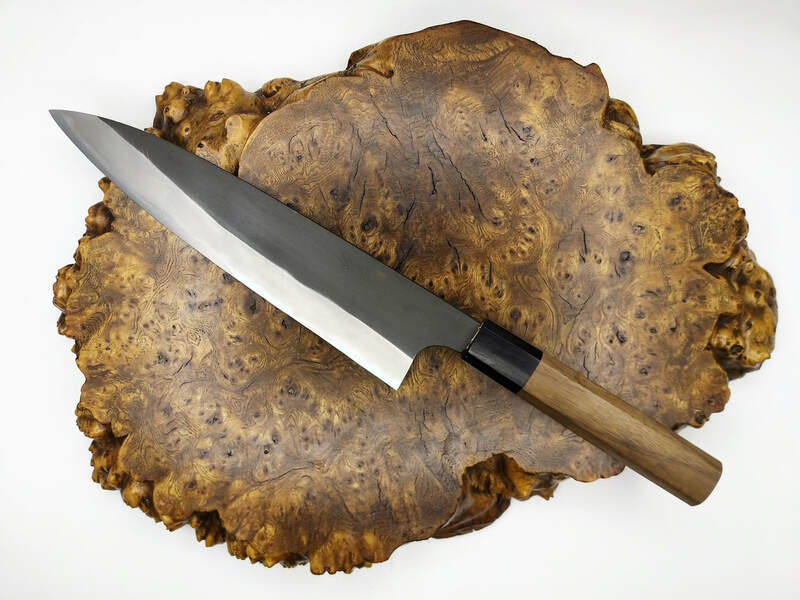 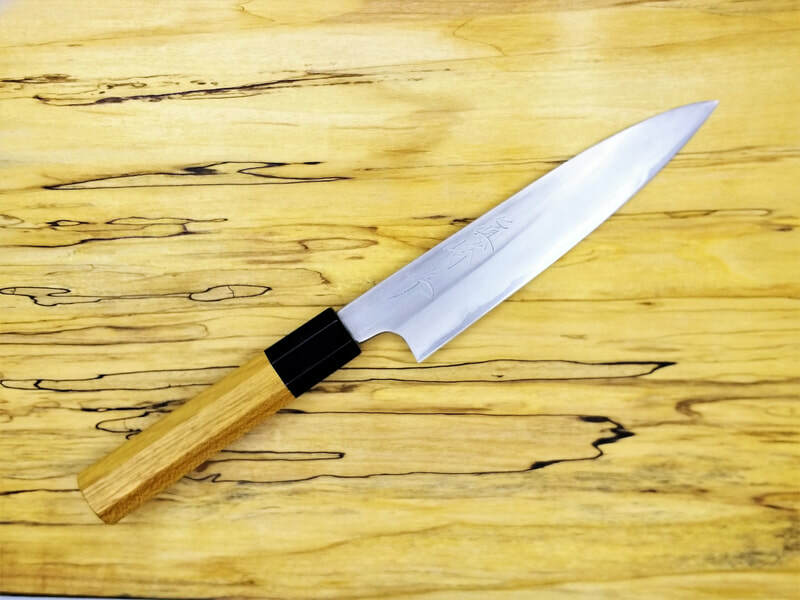 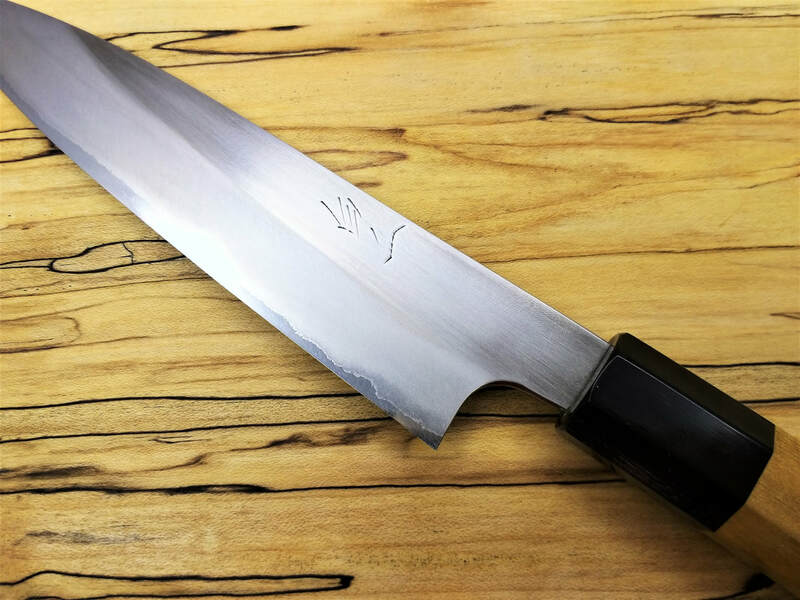 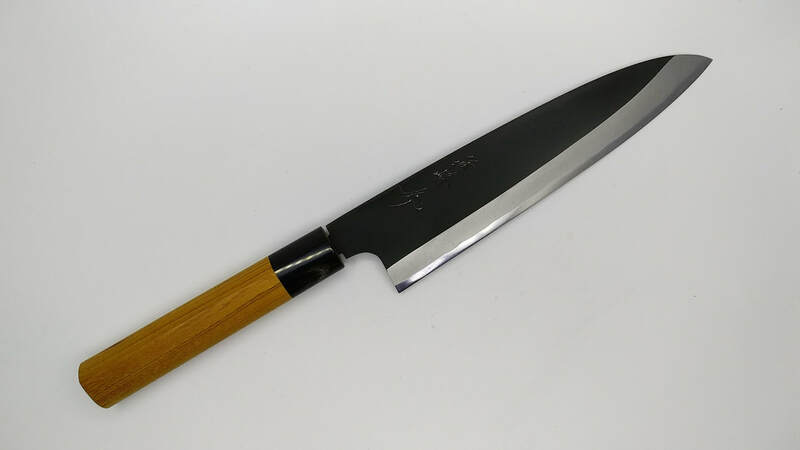 Available only in 210mm Gyuto as it solely made by the maker himself; from start to finish including the hand engraved kanji. 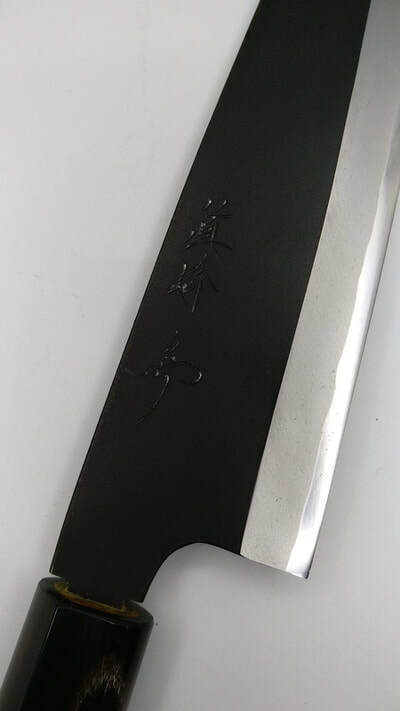 Limited quantity available for Polished and Kurouchi (Black) finish. 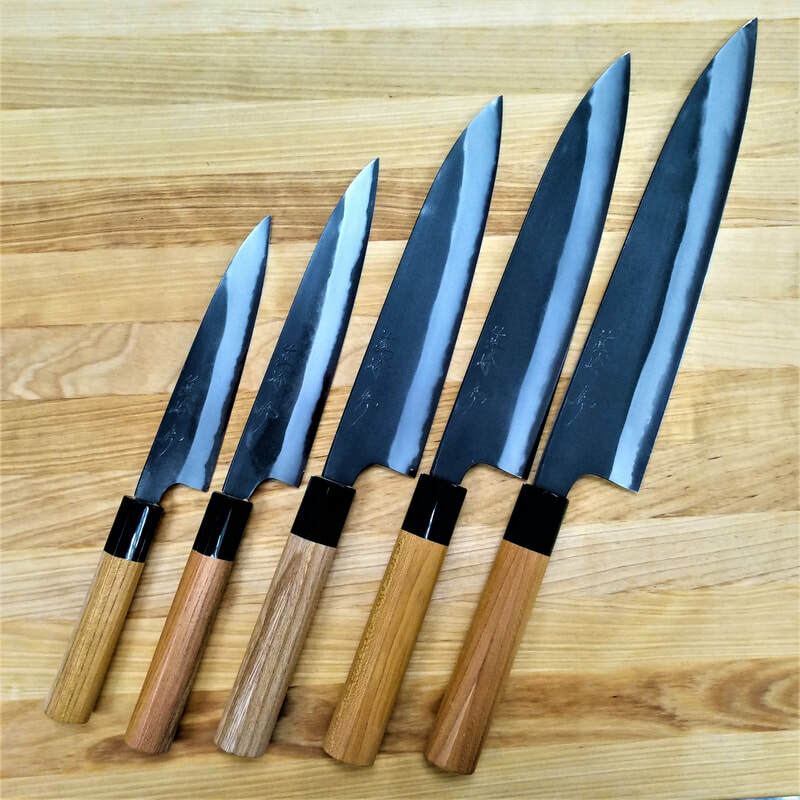 We chose the White 2 for best possible sharpness and Kurouchi for less reactivity on the iron for the cladding and a high HRC for a long edge retention. The knives are nicely finished with rounded spine and choil and finished on a #3000 Natural Stone. 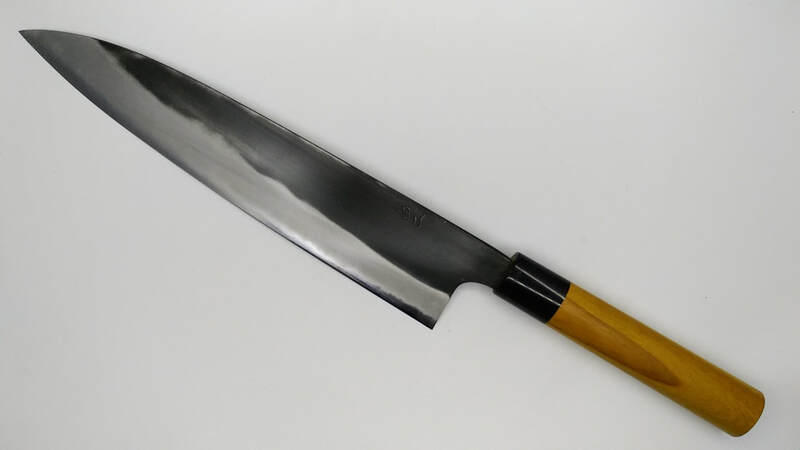 Our standard free sharpening within the first month applies to this range also.